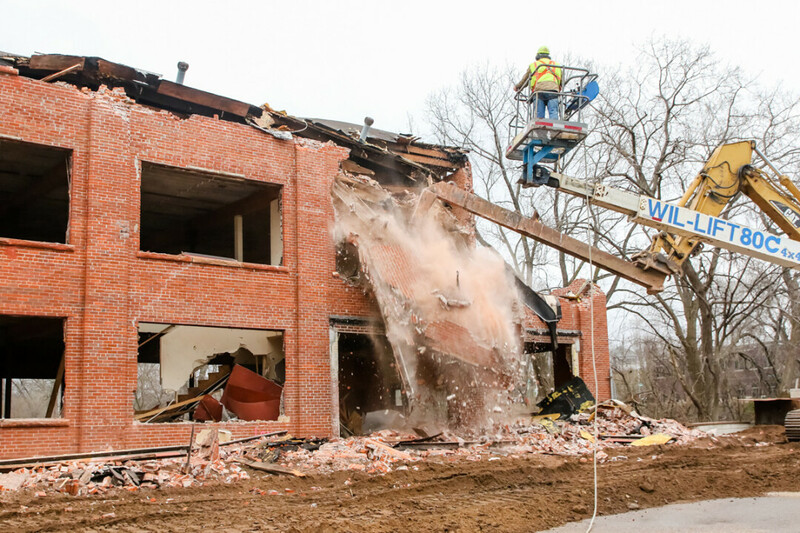 Crews razed the century-old Huebsch Laundry building on November 29. In the wake of demolition crews ripping down the old, dilapidated Huebsch Laundry building at the corner of N. Dewey and Galloway Streets, many are wondering exactly what (new owner) JCAP Real Estate has in store for the property – one the nicest parcels of build-able riverfront land to remain in downtown Eau Claire. People had been daydreaming about remodeling that building for decades but now, with such a clean slate, there's room for bigger dreams. As we reported last week, JCAP is considering a mix of commercial space and condos. They even have an initial site concept detailing three new buildings. But is that what you'd do? What other ideas do you have? Heck, even Justin Vernon has been sketching/tweeting about the property. If Vernon can dream, why can’t we? The Volume One World Headquarters sits right across the street, so we're understandably very curious about what will rise from the Huebsch ashes. What About You? Download a Blank 'Huebsch Property' Site Plan! Even if you don’t own the land, we’re betting you have your own idea (or twenty*) as to what should happen with one the city’s most interesting development properties. In that spirit, we’ve prepared a handy downloadable PDF showing the former Huebsch site. Print if off and start sketching. Your hard work and vision may have zero effect on the final project, but it’s fun to brainstorm, right? *Yes, we know you’d love a French bistro overlooking the river. Any other ideas?